IN THE YARDS OF CRUMBLING BUNGALOWS AROUND L.A. Here's an archived "All Things Considered" piece that seems apropos for this season of paradox, new birth, and the light shining in darkness...you can listen to it here. I just don’t have the natural touch with plants. I overwater--they turn yellow and rot; I underwater--they shrivel up and die. One day several years ago my husband Tim and I were walking through the neighborhood when we spotted a Japanese woman tending a jungle of plants. They had thick, spear-shaped leaves and blossoms in gorgeous colors of gold, purple, Moroccan red. “What do ya call those?” Tim yelled through the fence and, half-an-hour’s worth of friendly conversation later, we were walking home with a fistful of epidendrum cuttings. I stuck a few in potting soil and, lo and behold, one of them took. Not only took, but eventually grew to a towering, health-radiating six feet. It was my crowning horticultural triumph, and every time I looked at it, it reminded me of everything that was best about Tim: his sense of fun, his openness, his talent for serendipity. Two years later, we separated. We’d agreed that parting ways was best but that didn’t make the parting hurt any less. I tended the plants more absentmindedly than ever: watering the browning bromeliads, killing off orchids: did I have a black thumb when it came to relationships, too? 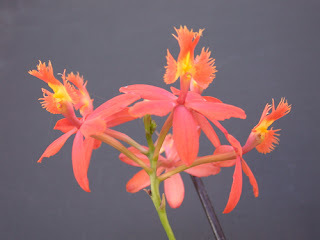 The day Tim moved back East, I cut the epidendrum back so far it almost died: the remaining spindly stalks looked weak and drawn, as if undergoing chemo. In between, I made treks to the downtown courthouse, sitting for hours in the do-it-yourself divorce clinic, standing in line at the filing window, a 14-year relationship reduced to a few bloodless, boilerplate forms. “Date of marriage: 5-12-90” would bring me back to the spring day we’d eloped to Nantucket and made our vows before a chain-smoking Justice of the Peace. “Declaration Regarding Minor Children: There are no minor children,” would evoke how we’d almost decided to become parents, but some shared failure of nerve had held us back. “Basis of petitioner’s request: Irreconciliable differences,” made me remember how, even when the air was thick with unspoken anger and confusion, we’d still made it a point to eat dinner together every night. I hung up and looked out the window, thinking, How can you sleep beside someone every night for all those years and then have the relationship end? Maybe “end” wasn’t the right word, I tried to comfort myself. Maybe we were segueing into another kind of relationship, one we were still feeling out. 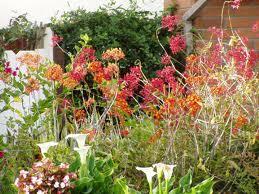 Gazing out over the courtyard, my eyes stopped short at the epidendrum. After months of neglect, the plant was thriving: the leaves lustrous, the grown-in stalks hardy. And way at the top were two blood-red blooms, nodding their young new heads, their stems intertwined. Thanks Heather for capturing so eloquently the dual reality of the bamboo orchard and your relationship with Ted. It was very poignant. It inspired me so much that I will go and kiss my wife tonight and reaffirm my gratitude for her being in my life. I will keep you in my prayers. When at last we met alone it was by stealth, like young lovers. Julia said: "Here in the shadow, in the corner of the stair -- a minute to say good-bye." "So long to say so little." "Since this morning; since before this morning; all this year." "I didn't know till to-day. Oh, my dear, if you could only understand. Then I could bear to part, or bear it better. I should say my heart was breaking, if I believed in broken hearts. I can't marry you, Charles; I can't be with you ever again." "Just go on -- alone. How can I tell what I shall do? You know the whole of me. You know I'm not one for a life of mourning. I've always been bad. Probably I shall be bad again, punished again. But the worse I am, the more I need God. I can't shut myself out from His mercy. That is what it would mean; starting a life with you, without Him. One can only hope to see one step ahead. But I saw to-day there was one thing unforgivable -- like things in the schoolroom, so bad they are unpunishable, that only Mummy could deal with -- the bad thing I was on the point of doing, that I'm not quite bad enough to do; to set up a rival good to God's. Why should I be allowed to understand that, and not you, Charles? It may be because of Mummy, Nanny, Cordelia, Sebastian -- perhaps Bridey and Mrs. Muspratt -- keeping my name in their prayers; or it may be a private bargain between me and God, that if I give up this one thing I want so much, however bad I am, He won't quite despair of me in the end. "Now we shall both be alone, and I shall have no way of making you understand." "I don't want to make it easier for you," I said; "I hope your heart may break; but I do understand." Thanks for the post. I have to go wipe my eyes,blow my nose and splash my face with cold water. And then do the dishes. Some of the most beautiful prose in the world is written in response to suffering. Like the snow in winter, it represents the cold and somehow, something much more beautiful and beyond. Heather, you wrote a one act play and or a beautiful prose-poem. This is truly wonderful. I would love to see if you could expand on this. But, only if you wanted. Very moving and it's good you are still in contact and talking. In the depth of winter, I finally learned that there was within me an invincible summer. Albert Camus. Philomena, thank you, the Camus quote is a gem--so apropos for Advent as well..